Our disposable cleanroom beard covers help keep your cleanroom environment free from contaminants. 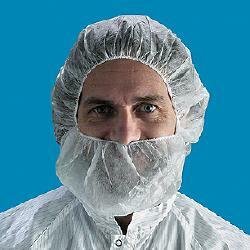 The beard covers are latex free and made from a soft spunbound polypropylene. Regular and extra large sizes available to fit any size of beard. Ideal for use in food plants, pharmaceutical, and lab environments. Full coverage for reliable contamination control.